Today's planned launch of the Low Density Supersonic Decelerator (LDSD) has been cancelled, meaning that ballocket fans have once again been denied the thrill of seeing a mighty 963,000m3 helium-filled orb lift a rocket-powered flying saucer into the upper atmosphere. 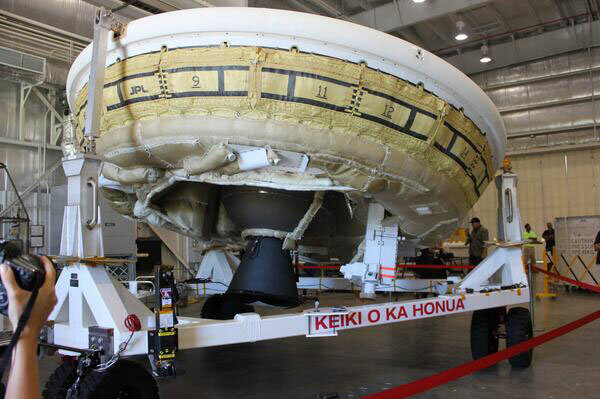 NASA had its LDSD all prepped and ready to roll yesterday, complete with ATK Star 48B thruster poised to power the test of inflatable deceleration airbags for possible use on future Mars landings. Sadly, the flight from the US Navy's Pacific Missile Range Facility (PMRF) on Kauai, Hawaii, won't now happen until Saturday at the earliest. No doubt there are readers who'd stacked a few cold ones in the fridge in anticipation, and are wondering just how difficult it can be to get a rocket-powered vehicle into the stratosphere for a simple flight to Mach 4, pump up a few "Supersonic Inflatable Aerodynamic Decelerators" and then throw out a supersonic parachute before nipping out into the Pacific for a triumphant ocean recovery.